After a quiet night in on New Years Eve, I went to Murray’s Cheese Bar in the West Village with hopes of starting 2016 off with a great first meal. I was not disappointed in the slightest. 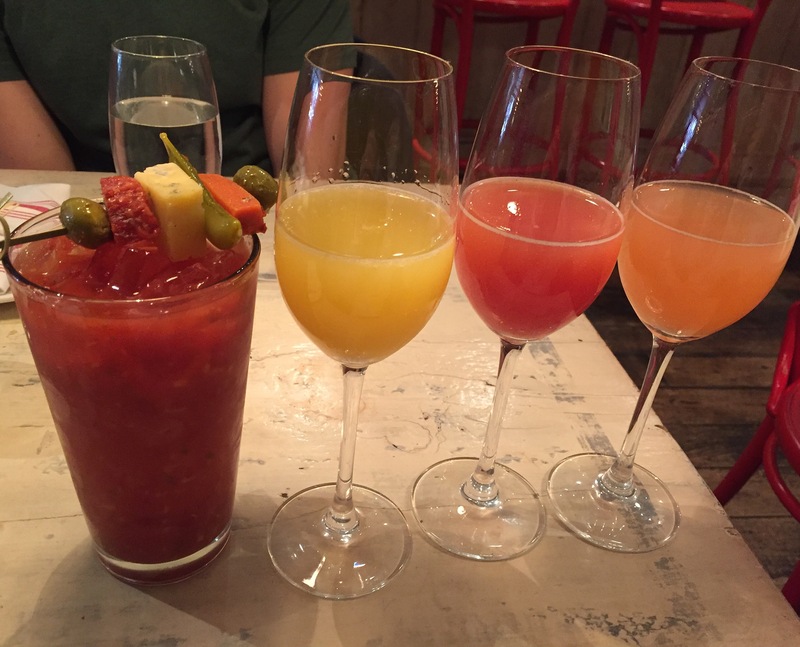 This first brunch was a superb introduction to 2016. Although usually I prefer Bloody Mary’s at brunch, on this first day of the year I found myself in the mood for some bubbly. I tried the Mimosa trio, which included, from left to right, a classic orange mimosa, a blood orange mimosa, and a strawberry mimosa. Surprisingly, the strawberry mimosa was my favorite. It really tasted like real strawberries, not just strawberry flavoring. 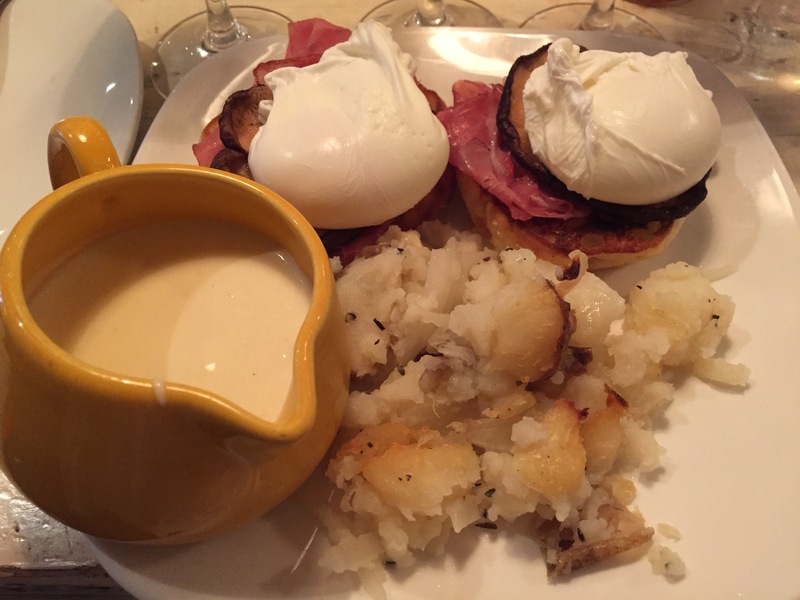 For my meal, I ordered the Alpine Eggs – 2 poached eggs on top of ham, mushrooms and an English muffin. It came with potatoes and the most divine cheese sauce. Eggs Benedict became one of my favorite breakfast/brunch dishes about ten years ago (I’m pretty sure it happened on the Disney Cruise). I went through a phase when I ordered it every time I saw it on a restaurant menu (I’ve also done this with creme brûlée and fettuccine alfredo). Eventually I realized that this decadent and rich breakfast was better enjoyed as a treat on special occasions. This was certainly one of those special occasions, and believe me, I was so glad I indulged. 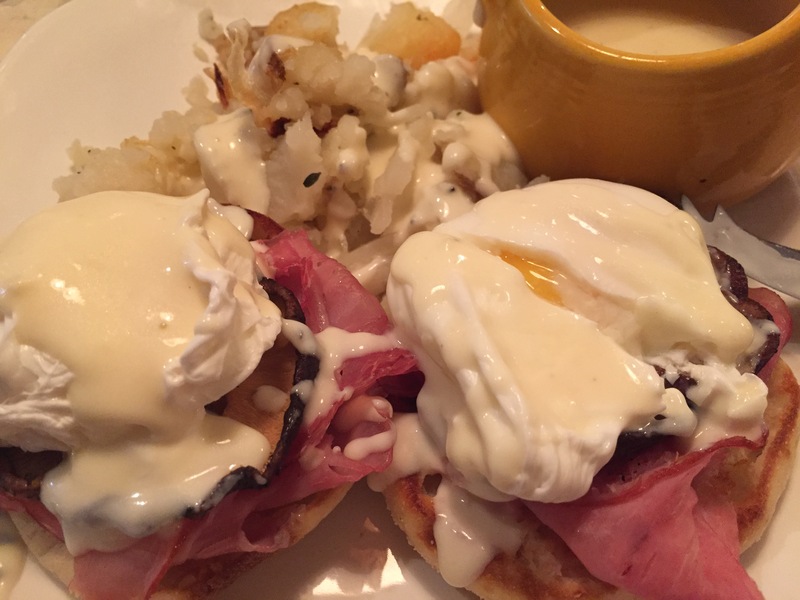 The eggs – perfectly poached with a soft white exterior and gooey yolk. The ham – crispy with a great salty element. The mushrooms – a surprise but a welcome one, as they added an earthiness to the dish. The English muffin – no offense to my staple Thomas brand, but this was THE BEST English muffin: soft, crispy and chewy, and you could definitely taste the butter that had melted into the nooks and crannies. The potatoes – soft with crispy bits, a perfect base for the sauce. AND THEN THE CHEESE SAUCE . . . OMG. As you can see, I poured it all over my eggs and potatoes. It was a perfect brunch to start off the year, and I am also now a huge fan of Murray’s and will certainly return.